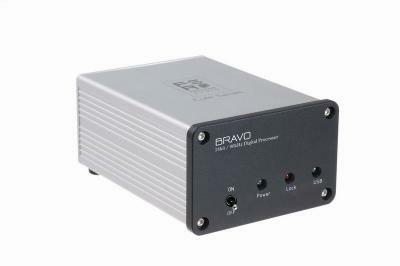 Bravo 24bit/96kHz Digital Processor audio amplifier from Firestone Audio Co., Ltd.
Hi-Fi Amplifier > Bravo 24bit/96kHz Digital Processor > Firestone Audio Co., Ltd.
Bravo is a digital processor. Using function of re-clock is to correct the jitter which is the time variation of a periodic signal in electronics in order to enhance the quality and details of sound. Adopting various kinds of support format (three types of input such as USB/Coaxial/Optical?two types of output such as Coaxial/Optical). Whole product supports 24 bit/96kHz digital signal format (include USB). Bravo 24bit/96kHz Digital Processor > Firestone Audio Co., Ltd.